The Russian handheld website, handy.ru, has obtained and published hands on pictures of the upcoming Palm Tungsten T. The pictures show the screen of the Tungsten T at various angles and a side by side comparison with a HP Journada 568. One noticeable change is, new default icons in the launcher screen. 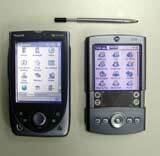 The Tungsten T has a 320x320 pixel screen, built in Bluetooth 1.1, 16MB of RAM, Palm OS 5 and an ARM processor. According to rumors, the Tungsten T will use the TI OMAP1510 processor, which combines into a single chip an ARM-compliant processor with a DSP for multimedia capabilities, and runs at 175 MHz. The unit also has an SD/MMC expansion slot. It is approximately 4 by 3 by .6 inches (102 x 75 x 15 mm) with the sliding part closed and 4.8 inches (122 mm) tall with it open. If this is correct, when closed this model will be slightly smaller than Sony's SJ series, which is 4.1 by 2.9 by .7 inches. Previous rumors spot it at 5.6 ounces. Todd Bradley, CEO of Palm's Solutions Group, said his company would be launching a handheld that runs Palm OS 5 on October 28. It is widely believed this is the model he is referring to. The Tungsten T already appears in the inventory system of a major electronics retailer, which says it will cost $500, though this isn't necessarily correct. The German Catalogue displays a price of 649 Euros, which is approximately $640 USD. Electronics are typically more expensive in Europe than their US equivalents. The device is really compact when the graffiti area is not exposed! I wonder can the cover slides out itself automatically when the device is powered on? The screen looks good as well. yeah its very small, but NO virtual graffiti!! that is my one complaint. Don't forget that virtual graffiti would require a bigger backlight which would shorten battery life. I have a T615c, but I think I'm going to like replacing it with a smaller volume unit with hopefully much better battery life. And I can't wait to benchmark a few armlet code modules and see if they really run more than 20 times faster. Also, VG will require a physically bigger screen, so the sized of the Tungsten will always be the same size as when it is expanded. I for one would be willing to go without VG for the sake of a significantly smaller form factor. Having said that, I am still waiting to see what Sony reveals next. I have yet to make up my mind which OS5 device to get, but the Tungsten is the current front runner! I totally agree with the argument of a smaller form factor. I recently traded in my 665 for a SJ 30. Some people say I'm mad. For me, I believe that a small form factor over rides the incremental speed of the 66 MH gained with the 665. Although the SJ30 does not have the bells & whistles, I find that MP3 and the other "stuff" is worth the giveup compared to the smaller form factor. Now, If Sony produces a new SJ series with an ARM based processor and vertual grafitti, and put a phone into it, people, I believe we would have the ultimate PDA. What do you think??? It's really not that small at all. Just take a ruler to an m515, and the dimensions are almost identical to the _closed_ dimensions of the TT. Open it must be as long at the Sony NR series. I wonder can the cover slides out itself automatically when the device is powered on? and 3 just another thibng to break. I dont like the idea of mving parts on the handheld anyway. Im even leery about mem expassion becasue of the moving parts which is nothing compared to this. Long live the "T" Series! What did you expect? An inch less? I mean compared to the m5xx series and the features that come with the new tungtsen, I would say it is small. Even if it is as long as the NR series when extended, how often would you use graffiti? And would it be bad? I mean everybody here seams to love the NR s, so where is the problem if something is as small as???? > when the device is powered on? Why would you want it to do that? The whole reason I think the slider could be a nice feature is that I often use my PDA with no need for text input. >>It's really not that small at all. Just take a ruler to an m515, and the dimensions are almost identical to the _closed_ dimensions of the TT. Open it must be as long at the Sony NR series. I admit i haven't measured the height of an m505 or m515 myself, but the dimensions i have seen list those units as 4.5 inches in height. Thats a difference of .4 inches between those units and the Tungsten T. The other thing here is that the Tungsten T has a D-Pad which is larger in circumferance than the buttons are (so it takes up more 'height') - thus, the sliding mechanism isn't here just to make it .4 inches smaller then the m series - its here to keep keep it from being .4 inches larger. >> when the device is powered on? >Why would you want it to do that? The whole reason I >think the slider could be a nice feature is that I often >use my PDA with no need for text input. Yes, but how often do one needs to tap on the "Home" or the "Menu" icon in the silk screen? I think Palm needs to provide a software or hardware button equivalent for those two functions, if one wants to use the PDA without sliding the cover out. To slide the cover out, it may solves the battery issue by using a mechanical spring. Just a thought. something i just realized looking at the pictures: the sliding cover would rip off any screen protector you put on the graffiti area. Right? Since when is the SJ30 smaller than the T665? It's just an illusion. Shorter, yes, but if you multiply the 3Ds the SJ30 takes up more volume than the T665. From previous pictures it was difficult to tell what Tungstun T is like, size-wise. Now, looking at these photos it changes my mind about how successful this wil be. I'll wait to see it in person to make my final judgement, but it looks like Plam has got a winner here. I'm Clié fan, but I like what PalmSolutions is doing. Built-in Bluetooth in a compact size. There may be better hardware out there but noone really has it all down to this size. Palm IIIe -> Sony Clié T665C -> ??? Can the device be turned on by simplying sliding the cover out? It is quite small but isn't that what we want? by the way, Can someone buy me a TT? What's everyone's thoughts on the new 'expanding' stylus..? Anybody notice where this fits in to the Tungsten|T or that there appears to be no raised area for easily removing it as for other styli? Hard to tell is this is a Tungsten|T or an Oslo, due to the blurring of the top right corner. But you can just about make out the words 'Bluetooth 1.1 Compliant' on the back [under the reset pin hole] from one of the images, but anybody else able to read the others ... what's it state under OMAP))? Nice to get a better idea of the sliding mechanism though. Still, can't wait to get the chance to have a play with one in a store. Oops - Just worked out it only says 'Texas Instruments Technology' under OMAP)) so nothing exciting there :( Need my eyes testing I guess. Looks good. My Newton 110 has one and I like it. The size of the new stylus looks great! It will surely make the sony stylus feel...well...inadequate IYKWIM. For those of us who've been around since the early days, you may remember the DIY stylus for the Old Palm pros, 5000s, etc by a guy named Eric Handy. He used a radio shack antenna and the tip of a regular stylus. I made one following his directions- you ended up with a stylus that fit perfectly in the slot, had a much nicer, heavier feel, and then extended to over a FOOT in length, so that you could make it a decent pencil size (6") or use it as a pointer. oh man, that stylus is going to be expensive if you lose it! Someone please give me a link to the pictures. I can't read Russian! The ones missing, after Prefs alphabetically, would be Security, SMS, To Do List and Welcome. Those four would be enough to account for two more rows and that's what seems to be missing according to the scrollbar. There could be two more though. I mean, it's supposed to "take full advantage" of the multimedia capabilities. But where's that mediaplayer?? Besides the Memo Pad and Note Pad, there will be also Voice Pad. for MP3 playing, according to my experience on the previous OSLO i played with, it needs a 3rd party software.... that means, user have to pay for their own MP3 player software. Will Winamp enter the market??? Winamp for Palm? That would be cool! Would we be able to play mp3 in the background? I hope I can use my Palm while listening to the MP3. Probably Palm will do it like they always do. Put in the basic progs and thats it. Actually, I disagree. Palm always has bonus software. With the m515, you get Documents to Go, Avant Go, Chapura, Power One Graphing Calculator, and several other apps. It would make perfect sense to include a media player to help promote sales. I wonder if Hand Zipper and Insider come with it too? iTunes for palm- that would be awsome! my annoying little brother wrote the above comment and I don't know why he put it on such an old story. By the way the TT is way better than the TT5. Well, this answers most of our questions. I ran the russian web page through Altavista-you can get some useful info off of that-is there anyone here who knows Russian and would be willing to translate it for us? "I do not know accurately, to what series it belongs.that whether of Oslo, the whether Tungsten, marking was absent.According to some signs/ criteria, most likely, this of Oslo, the prototype Of tungsten.But the design of the first pal6ma. under the administration Of palm OS 5.0 will change hardly." Perhaps the Oslo prototype did have a 175 mHz processor but for release they decided to back down to a 144 mHz unit on the Tungsten T? This was a Oslo prototype shown, not the Tungsten T.
Although the stylus telescopes, is that as far as it goes?